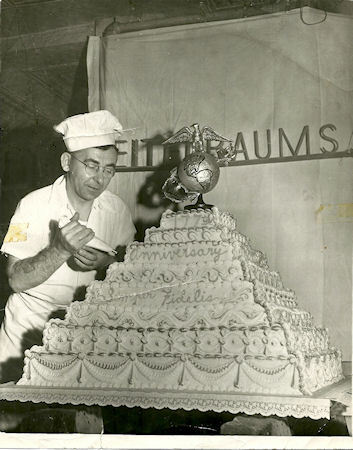 At 14 years old, my grandfather, Tony Skubish, who was of Polish decent, started as a cake decorator for Titalbuams Bakery in Philadelphia. When he was about 40, he began working for the famous John Wanamaker Crystal Tea Room in Philadelphia. He worked there until he retired. 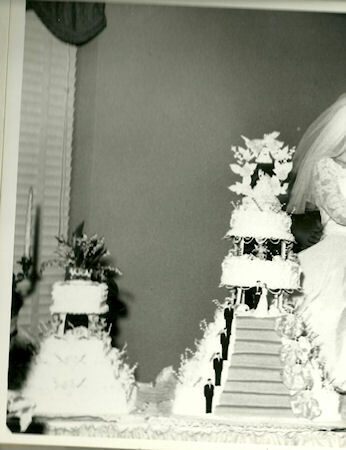 He was famous for his wedding cakes and doll cakes. He was like the "Cake Boss" of his time. The pictures that are included are of a wedding cake that he made for my parents as well as a cake that he was commissioned to make honoring the U.S. Marines 100th birthday. This picture appeared in the Philadelphia Bulletin Newspaper. 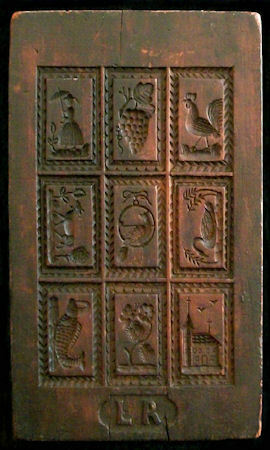 In reference to the Springerle board, my father does remember him making cookies like the shapes on the board. I'd like to thank you and your parents for sharing your family photos and history about this mold. It is really great to be able to see the baker and the mold that he used. Really brings the connection home.